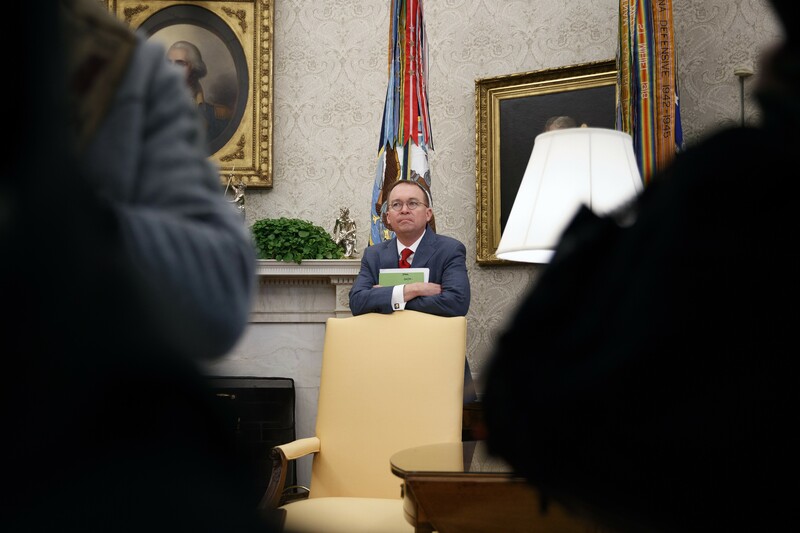 Mick Mulvaney, the acting chief of staff, in the Oval Office on Jan. 31, 2019. Mulvaney had spent years in the House saying that the Affordable Care Act should be repealed. WASHINGTON — The Trump administration’s surprise decision to press for a court-ordered demolition of the Affordable Care Act came after a heated meeting in the Oval Office on Monday, where the president’s acting chief of staff and others convinced him that he could do through the courts what he could not do through Congress: repeal his predecessor’s signature achievement. Mick Mulvaney, the acting White House chief of staff and former South Carolina congressman, had spent years in the House saying that the health law should be repealed, and his hand-picked head of the Domestic Policy Council, Joe Grogan, supported the idea of joining a Republican attorneys general lawsuit to invalidate the entire Affordable Care Act. But a district judge in Texas ruled that the entire law was rendered unconstitutional when President Donald Trump’s tax law brought the tax penalty for not having health insurance to zero, and the administration faced a choice: stick with its more limited intervention or back the judge’s decision. Trump has declared that he has kept his promises, Mulvaney and Grogan argued, and as a candidate he campaigned on repealing the health law. His base of voters would love it. Among those with concerns was Pat Cipollone, the White House counsel, who shared that the new attorney general, William Barr, opposed such a move. Vice President Mike Pence was worried about the political ramifications of moving ahead without a strategy or a plan to handle the millions who could be left suddenly uninsured if the suit succeeded. But Trump had been sold, and on Monday night, the Justice Department issued a letter saying it supported the Texas judge’s decision. Trump predicted that the Texas decision would be upheld by the appeals court, then go to the Supreme Court. But Republicans in Congress have no obvious road forward on legislation to replace the Affordable Care Act that could pass the Democrat-controlled House.